Flaky tender pieces of fish deep fried to perfection served over keto tortillas and the ultimate creamiest taco sauce ever. 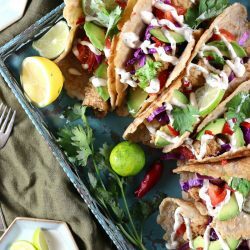 These keto fish tacos are the best street food you’ll ever make in the comfort of you own home! This low carb breading for fish is absolutely amazing! My favourite part is that it’s dairy free, pork-free and nut-free! Just like my low carb fried chicken recipe, I used egg white powder to coat the fish pieces and deep-fry them. 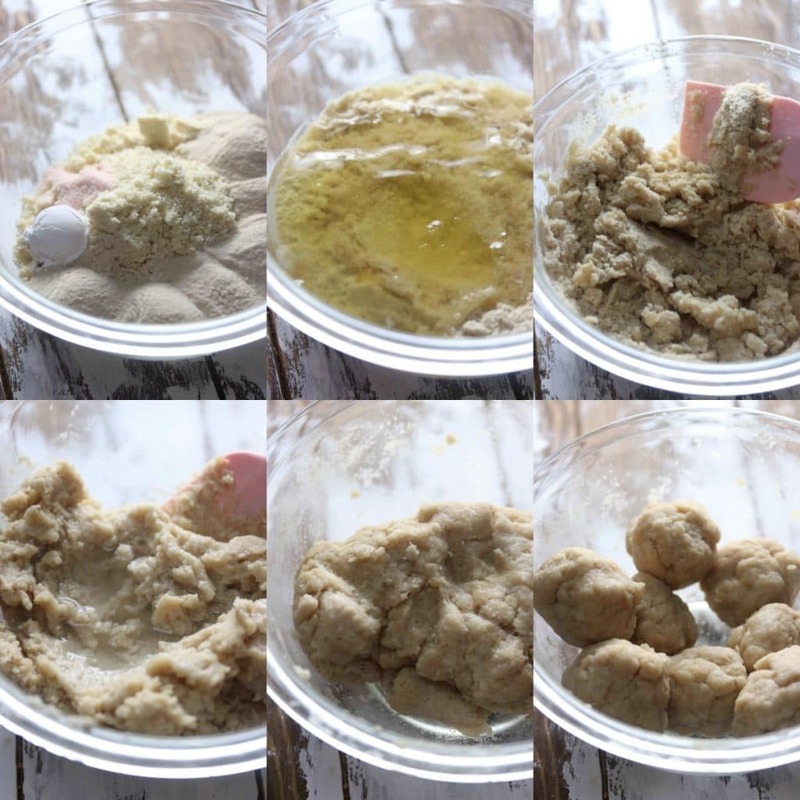 Most low carb breading recipes use pork rinds, parmesan, whey protein isolate like in my keto fried chicken, or almond flour. But I honestly think egg white powder is the best tasting out of all of the low carb breading options! I recommend using the egg white powder from NOW as egg whites are the only ingredients in there. You want to make sure to not get the protein powder kind as they usually add fillers and sugars in it. Using egg white powder for low carb fish breading is my absolute favourite! The batter becomes extremely crispy and flaky, just like normal fish breading should be. I recommend marinating your fish pieces in some spices before coating them in egg white powder so that your deep fried fish will be full of spices! 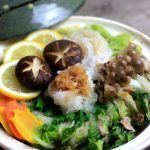 You can use any type of white-fleshed fish you want. I used sole. What spices should I use in my fish marinade? 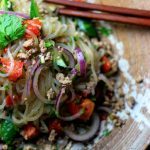 I recommend using a mixture of lime juice, cumin, cayenne, black pepper and salt for a couple of hours to give it those nice authentic flavours. You could also add a bit of spice to the egg white powder to give it that extra kick. How long should I fry my fish? Fish does not take a long time to deep-fry, so about 30 seconds to 1 minute should do it depending on how big the pieces of fish you’re frying. Can I fry this fish in an air fryer? No, air frying egg white powder or whey protein isolate does not work. You need to submerge the entire piece of fish coated with the egg white powder (or whey protein isolate) in hot oil for it to deep fry correctly, get crispy and bubbly. Using an air fryer to fry this deep fried fish will turn the egg white powder hard as rock, so make sure to deep fry it the old fashioned way – in oil like lard, avocado oil, ghee, beef tallow, or coconut oil. 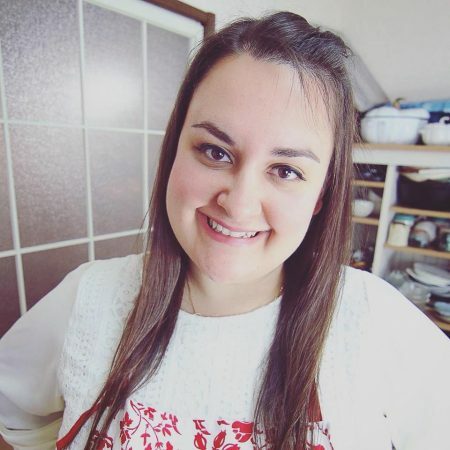 This keto taco sauce is actually my favourite part of the recipe and I should have tripled the batch because it was just that amazing. I drizzle the sauce all over the tacos, but I really just wanted to dip each bite into this amazing fish taco sauce! What kind of sauce do you put on a fish taco? 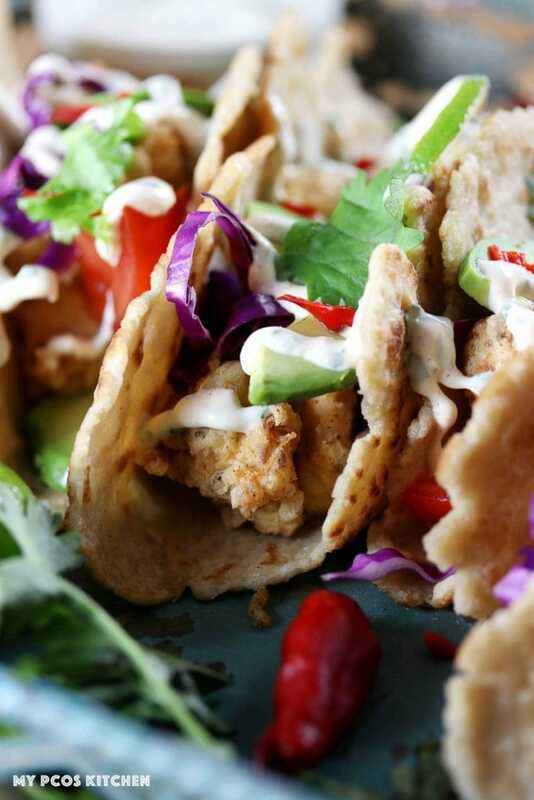 This fish taco sauce uses a mixture of sour cream, mayonnaise, garlic, cilantro and cayenne pepper. It’s the perfect creamy sauce to drizzle all over freshly fried fish. What Keto Tortillas Should You Use? 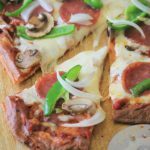 My keto tortillas recipe is your absolutely go-to recipe as these stretchy low carb tortillas can be rolled, stretched, and baked just like regular wheat tortillas. There’s a reason why this keto tortilla recipe is insanely popular on the blog – it’s the best low carb tortilla recipe out there! Plus, they’re incredibly easy to make, they can be easily stored in the fridge for later use, or even frozen! My low carb tortillas are made with a combination of psyllium husk powder, egg whites and almond flour. I recommend using psyllium husk powder from NOW as I’ve never had any problems with it. Make sure to get psyllium husk POWDER and not WHOLE husks. Your recipe won’t turn out the same. In what order should I make these keto fish tacos? 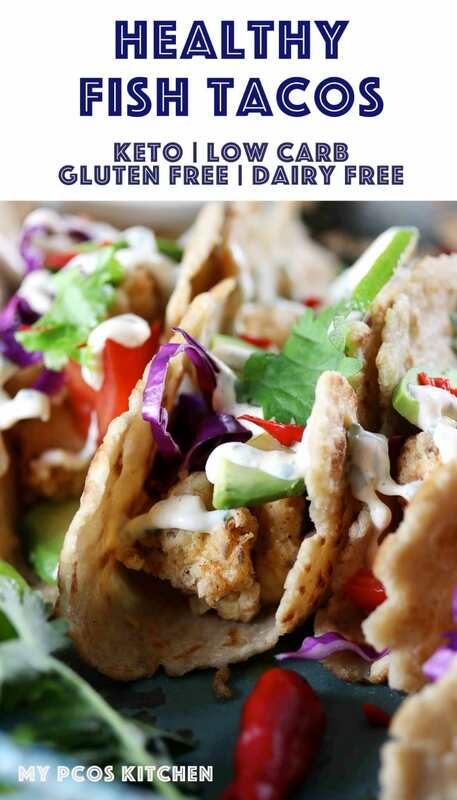 I want to make sure you get some piping hot keto fish tacos to enjoy so follow the following steps in order so that your food doesn’t go cold by the time all of the food is ready to eat! Note, I’ve eaten these tortillas for lunch cold and they are still ABSOLUTELY amazing! Make the keto fish taco sauce. Make your low carb tortillas. 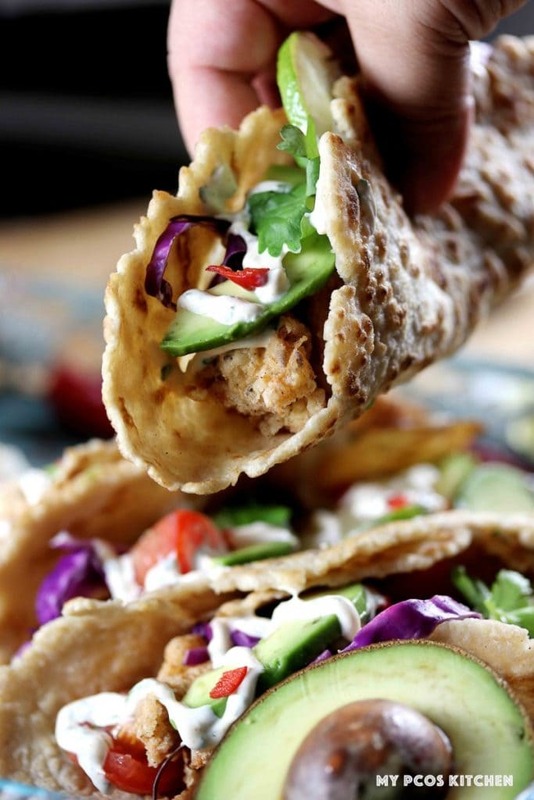 Assembly the low carb fish tacos together and they’re ready to eat! Use a white-fleshed fish like cod, tilapia, halibut, mahi mahi or snapper. Marinate your fish pieces into some lime juice, cumin seeds, cayenne pepper, black pepper and salt. Try to marinate the fish 30 minutes or more. In a bowl, mix together the sour cream, mayonnaise, chopped cilantro, minced garlic, and cayenne pepper. I added my sauce to a squirt bottle so that I could easily drizzle the sauce all over the low carb fish tacos, but you could also just dip your fish tacos inside the dipping sauce. I chose to use some red cabbage, tomatoes, cilantro and avocado. I just chopped them all up ready to top once my fish was fried. 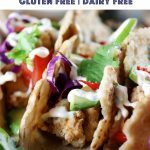 Here is a list of possible low carb vegetables you could add to your gluten free fish tacos. Mix the almond flour, psyllium husk powder, baking powder and salt together. Add the egg whites and mix with a spatula. Add the boiling water and mix until a thick dough ball forms. Separate the dough into 8 balls and roll out with a rolling pin or use a tortilla press. 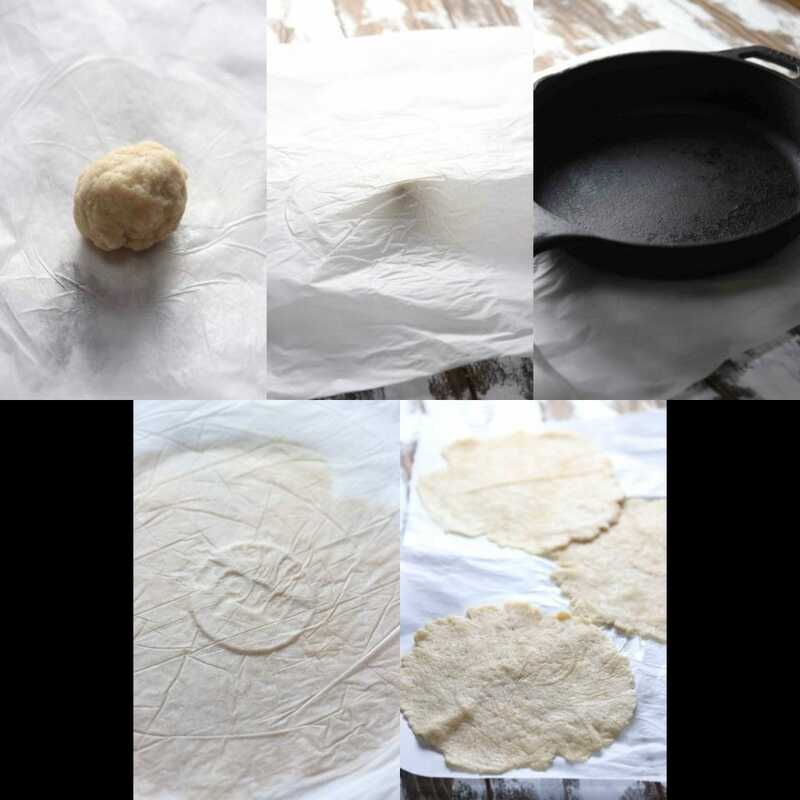 Make sure to add parchment paper under and over the tortillas so that they don’t stick to your rolling pin or tortilla press. Fry them up 30 seconds to 1 minute on each side with a bit of olive oil and nice and soft. Dip each piece of fish into mixed eggs and then dip one at a time the fish into the egg white powder. Add the pieces of fish into hot oil, about 130-140C/266-284F. Cook for 30 seconds to 1 minute or until the batter of the fish starts to get golden brown. Add the hot keto fried fish to your keto tortillas, add whatever vegetables you chopped and drizzle a generous amount of taco sauce over everything. 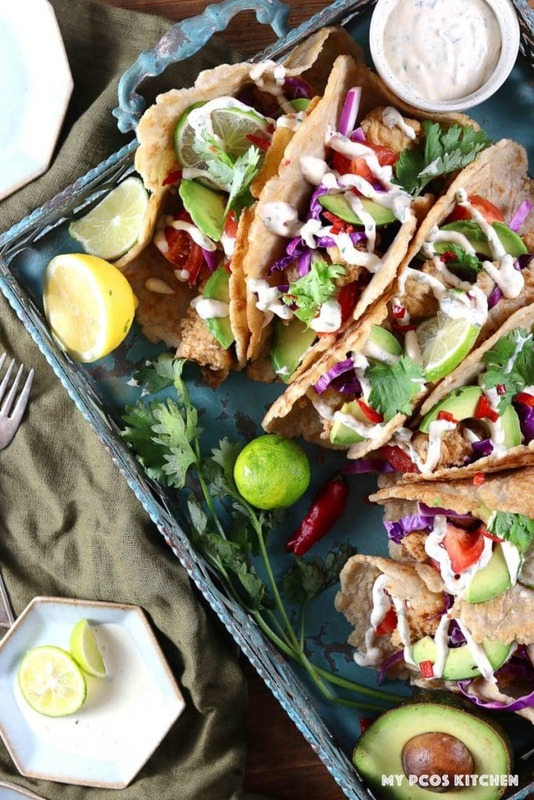 Your keto fish tacos are finally ready to serve! 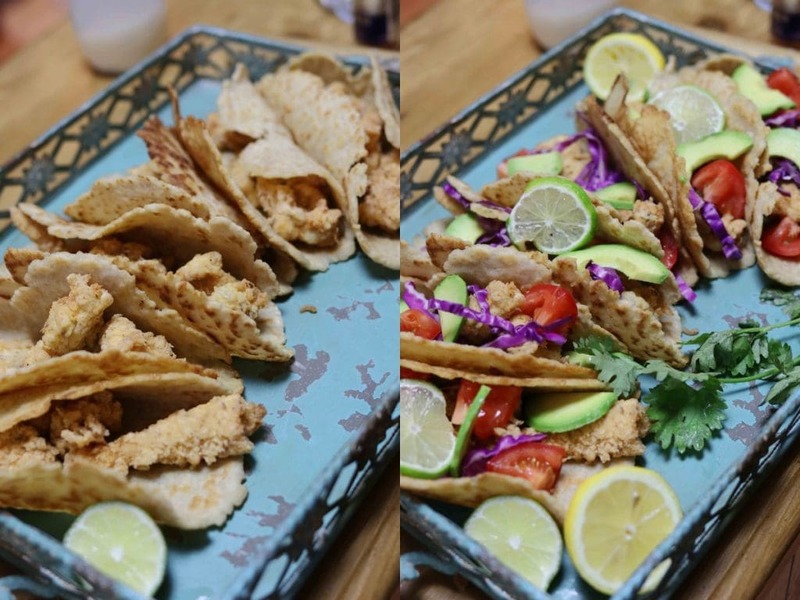 Make sure to follow the following tips to ensure you make the best keto fish tacos out there! You can’t air fry egg white powder or whey protein powder. Make sure to deep fry your fish the old-fashioned way. Don’t forget to coat your fish with eggs BEFORE coating it with egg white powder or else the egg white powder won’t stick. Use any type of white-fleshed fish you want. Tilapia, halibut, cod, mahi mahi, snapper are all good options. I used cod. Make sure to marinate your fish before coating it with egg white powder or else, it’ll turn out pretty bland! Make sure to use psyllium husk POWDER and not WHOLE HUSKS when making your keto tortillas. Use any type of vegetables you want for the filling. Pro tip: Double or triple the fish taco sauce. It’ll be worth it. Trust me. Delicious soft keto tortillas filled with crispy low carb fried fish and the best taco sauce ever! Cut your fish filets into bite size pieces. In a small bowl, add the fish filets with the spices and marinate for a good 30 minutes. Chop and dice all of your vegetables that are going to be used for topping. For the taco sauce, mix all of the ingredients together in a small bowl. You can either spread the sauce onto the tortillas when ready, or you can add the sauce to a squirt bottle and drizzle it all over the tacos. Make the keto tortillas recipe. In a small bowl, add the 2 eggs and mix well. In a separate bowl, add the egg white powder and paprika. Mix together. Heat the frying oil in a small pot until it reaches a temperature of 140C/284F. Dip the fish fillet into the eggs and the coat entirely with the egg white powder. Once coated, add the fish into the hot oil. Fry for 30 seconds to 1 minute. Since it's fish, it shouldn't take too long to cook. Once the batter is golden brown, it should be ready. Take the fried fish out of the oil and repeat with the remaining fish pieces. Add your fried fish, vegetables onto the keto tortilla and drizzle the taco sauce all over. They are now ready to serve. Note: These are really yummy served cold as a wrap for lunch! The nutritional information is for 1 serving (2 tacos). It includes the tortillas, fried fish, veggies and taco sauce. I found this to be a very frustrating recipe to follow. I did appreciate all the helpful hints however there seemed to be no consistency in the way the recipe was written/the measurements. For example, the amount of egg white powder was listed in ml which is a liquid measurement however it is a dry ingredient. Also the tortillas were very fiddle to make and very crumbly. Overall, everything tastes good but it was very time consuming and I wouldn’t make the tortillas again. Hi Heather, sorry you had a hard time understanding my recipe. I definitely try to be accommodating to everyone. If I list in grams, then people complain I didn’t use cups. If I use cups, then people complain I didn’t use ml or grams, etc. If I use ml, then people complain I don’t use grams or cups. So it’s very hard for me to keep everyone happy with the measurements. I used 62ml (1/4 cup) of egg white powder for this recipe. I didn’t measure it in grams because I simply scooped it out with a measuring cup. As for the tortillas, they shouldn’t break apart on you. The psyllium makes them very sticky and it’s nearly impossible for them to not stick together. You’re the first comment I get about that. Make sure to add the proper amount of psyllium. Can’t wait to try this. Where can I find egg white powder? Oh these tacos look delicious!! I’m excited to make this recipe now, thank you!